Never fall short of power outlets to plug all your gadgets and devices with the help of non-motorised DeskPORTS. 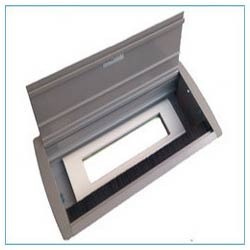 It is a netbox solution that's handy and easy to install in any kind of a business setup. - Displays a configuration of 2 Power, 1 Switch and 1 Data port. Usage: For conference room ,work station etc. This table device specifically for the multimedia conference. It adopts our patented audio/video processing, transmitting technology, and has also advantage for its delicate appearance. 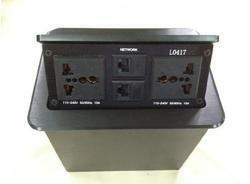 Table receptacle system and cat transmitter for table up to 70mtr. - Its supports to HDMI/DVI/VGA/YPbPr/CVBS. - Signal’s output using a network cable or fiber optic.